Camels are ideally suited to the hot, dry climate of Australia's interior. Imported here in the 19th century, they remained the principal means of outback transport until railways and roads were established. Today there are an estimated 200,000 one-humped, dromedary camels in the wild. Though few camels are used by humans today, this herd is treated like family, each one has its own pet name and personality. With a breathtaking view of Uluru as your backdrop, this relaxed, slow-paced camel ride is the perfect way to experience the fascinating ecology of the desert. Ride across the desert on a peaceful 1-hour camel ride through stunning sand dune country with the awe-inspiring sight of Uluru and Kata Tjuta as your backdrop. Take in the cool morning air and watch as the rising sun lights up Uluru and the surrounding plains. Learn about the landscape and fauna from your expert cameleer, and enjoy billy tea and freshly baked beer bread (damper) with quandong jam (outback native fruit) after the ride. 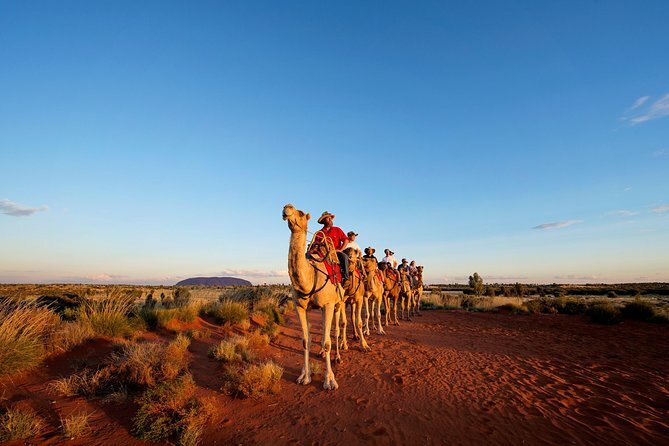 Take a 1-hour camel ride at dusk to see the outback colors deepen as the sun sets behind the desert plains, sharpening the monolithic outlines of Uluru and Kata Tjuta. Return to the camel farm at twilight to enjoy drinks and outback food, including freshly baked beer bread (damper). For a shorter camel ride, cross the desert on a 45-minute express camel trip for views of Uluru, Kata Tjuta and the outback landscape. Hear interesting facts about the local flora and fauna, and visit the camel museum to learn about the important role played by camels over the centuries in outback Australia. The afternoon express ride is seasonal and only operates from April to October.